Editor’s note: Paul Horstmeier is a finalist for 2017 Content Marketer of the Year. We will be sharing insight from all CMY finalists in the blog before the winner is announced at Content Marketing World this month. For many content marketing teams, the email subscriber count is a pivotal measure of success. After all, a quality email list is a vital component of a high-functioning modern marketing department. And, traditionally, you get more subscribers by putting enticing resources behind an email gate. In other words, you require someone to provide their email address to access something of value. But when Paul Horstmeier took over as senior vice president of marketing for Health Catalyst, he couldn’t follow this typical content marketing script. The health care audience is historically skeptical of marketing, he says, so he wanted to give them an experience that didn’t feel like marketing. To do that, he tore down the email gates. Removing this traditional piece of the marketing puzzle has made end-to-end attribution more challenging, but it’s also turned Health Catalyst into one of the most trusted brands in the health care space. Their events, both online and in person, routinely sell out and shatter industry benchmarks. And they’ve drastically streamlined a long and complex sales cycle. 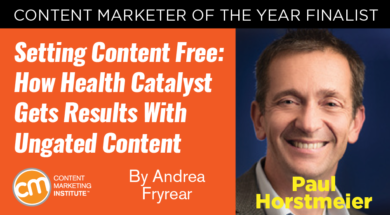 Paul is a nominee for Content Marketer of the Year, and he gave us insight into how ungating content has unleashed amazing results at Health Catalyst, a health care data warehousing, business intelligence, and analytics company. Health Catalyst provides a huge collection of content to its audience; we’re not just talking a couple dozen short blog posts. When we interviewed Paul, there were 612+ openly available resources on the Health Catalyst site. A few things still require an email address to gain access, but Paul ensures that gates are only put up when it’s beneficial to the audience. Webinar attendees, for instance, need reminders of when the event is as well as instructions to access the presentations during and after the event. In this case, asking for their email address is key to giving them a great experience. The same thing goes for e-books, which Health Catalyst regularly revises with updated research. By collecting someone’s email address, they can alert the subscriber when a new version is released. For everything else, Paul says, they want readers to want to sign up for emails because they genuinely enjoy the content. “Our goal is to be such good educators that you’ll want to raise your hand,” he says. To offer that level of value, Paul and his team work to make each piece of content enormously valuable to the audience. They turn their best articles into multimedia presentations and embed the slides on the website. “People download them and share them with other decision-makers,” Paul says. “It’s a really easy way for brand advocates to spread the word.” Health Catalyst uses a third-party expert to create the slides, usually within a week of an article’s original publication. The company has about 400 presentations to date, all of which are ungated. Finally, Health Catalyst makes it easy for readers to consume multiple pieces of content in a single session. Content creators follow pre-publication worksheets that include listing five related pieces of content to link at the bottom of an article. Health Catalyst also uses a time-tested content marketing tool – the pop-up window – but instead of asking for an email address it offers suggestions for further reading. Burning down email gates delivers a less intrusive experience for the audience, but it also delivers great results for the business, particularly for Paul’s colleagues in sales. The complex and lengthy sales cycle at Health Catalyst means that not even the most sophisticated content marketing initiative could replace sales. But Paul knew that if his team could deliver well-educated prospects, then they could shorten the time between interest and purchase. “After about four months, the president of sales came back and said, ‘I don’t know what you’re doing, but something is different. People are coming to the first meeting ready and prepared. I’ve never seen anything like it,’ ” Paul says. In addition to giving the sales team a boost near the bottom of the funnel, Health Catalyst’s ungated content also increases the number of prospects. Website traffic grew by over 100,000 visitors per month, almost entirely through the content and related SEO efforts. As they track these organic visitors’ behavior, they’ve learned that the most active researchers usually are receptive to a call. The Health Catalyst inside sales team is never pushy or aggressive when contacting prospects. Instead, they continue in the same spirit of the content – helpful and educational. Paul’s crusade to tear down the email gates went big right away thanks to substantial executive support for a purely educational approach to marketing. For organizations not quite so committed, Paul thinks a small-scale experiment could work. He suggests starting a thought leadership pilot by developing experimental content, which is left open and ungated, to see what kind of results you can get. Simple metrics like time on page and return visitors can give you a snapshot look at the project’s performance. Small teams can make a big impact, Paul says. Health Catalyst’s content team spends most of its time working with thought leaders within the company. Over time they’ve developed a process to make it as easy as possible for these contributors to create content. They’ve spent a lot of time perfecting their interview skills, an important step for making the most of the time they have with busy executives. They’ve also made the case to internal thought leaders that two hours with the content team can scale their reach dramatically. This accommodative approach allows Health Catalyst to publish several articles per week from a stable of about 70 authors, 95% of whom are internal subject-matter experts. With several years and hundreds of articles behind them, Paul and his content team are more committed than ever to their gate-free approach to content. They have an efficient, productive relationship with their internal contributors that produces industry-leading content, which in turn shortens and simplifies a complex sales cycle. It’s a strong argument for staying true to the education-first mantra that’s formed the core of content marketing from day one.